Posted by randydeutsch in books, fiction, nonfiction, reading. It is a truth universally unacknowledged, that an architect in possession of an imagination, must be in want of something to read. Those who read books outside their area of concentration will recognize this as a play on the opening line of Jane Austen’s Pride and Prejudice. Or perhaps a play the Zombie version? But then again you may have already known that, having seen the movie or listened to the book on your Kindle. This is hardly news to architects who don’t read. Incredulous, astonishing and offensive to those who do. This barrage of adjectives doesn’t make it any less true. And yet it is a well-known homily, universally acknowledged, that architects skim. Architects peruse. Architects gloss over pictures, images, photos and cartoons. If they read at all, it is only to read the captions. Face it, we need pictures. Pictures are an architect’s lubricant or device intended to enhance their reading pleasure. A graphic is to an architect what a marital aid is to a marriage. They keep things exciting, visually stimulating, less repetitive. Reducing friction, heat and wear. Lecturers have known this for years. We’re a visual group and need to have visual stimulation or you’ll lose us. I once heard architect Richard Meier at the Cultural Center in Chicago speak for an hour with slides flashing by – on automatic changer – every couple seconds. This experiment seemed derelict at the time – there was no relationship between what he was saying and the image that flashed past – but on another level, it didn’t matter. He might have been onto something in that the standing room crown, made up mostly of architects, needed eye candy – no matter what imagery was used. Ironically, directly behind him was a giant window, the soon to be setting sun’s glaring light created a black effigy of the architect, rendering the slides all but unwatchable – and therefore, his speech all but unintelligible. For what are words without images to distract us away? Authors also know this – when you write a book for architects you need to have pictures to break up the text (or is it text to break up the pictures?) – as though the whole point of the book was the pictures and that the text was the sorbet between – as though to say, you don’t really think anyone is going to read the text, do you? Or watch an author on YouTube. Video is the future. Books are out. Magazines on the wane. History. Caput. And yet – and yet. What is it that gives our lives gravitas? 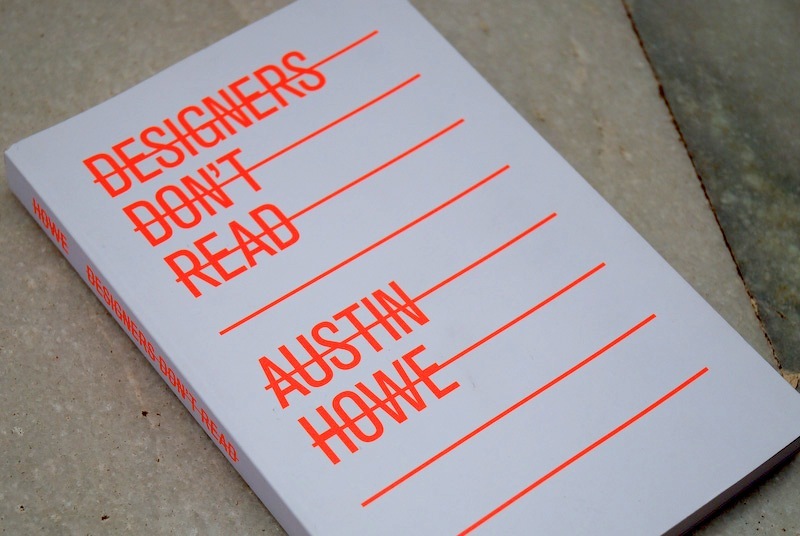 Creative director, writer and design advocate Austin Howe has written a cleverly inspired book, Designers Don’t Read, which has quickly developed a passionate and widespread following – despite the fact that it doesn’t have any pictures. Midwest Book Review calls it “a daily consult for designers and busy professionals and offers quick case history examples designed to enhance creative thinking and provide food for thought. More than a set of admonitions, these provide a page or two of detail and depth to advocate change and creative thinking, and is perfect for any design professional or arts library.” If you want to know more about the book, this review is a good place to start. And then there’s the question of what exactly to read? Fiction? Non-fiction? The Architects Handbook of Professional Practice? One day with a cup of coffee read the tiny print between the graphics in Graphic Standards or what Rem had to say in S, M, L, XL. It’s those darned hyperlinks (here’s a nifty, concise and comprehensive tutorial on how to create them. Oops I did it again!) Can’t get through a darned sentence without being transported to another site. And it’s only when closing all my windows that I remember where I was 20 minutes earlier. Architects looking for a way to distinguish themselves – as antiquated as this is going to sound – can do a lot worse than to pick up a book – a Kindle, Sony Reader, nook or the bound paper version – and start reading. We live in a time when the radical thing isn’t to burn books but to read them. It is winter in much of the world – a great time to curl up with a blog – as many of you are doing right now in reading this. But wait you say – surely I read. I’m reading this right now, right? And so you, dear architect, are the exception. Where to start? Some suggestions? What are your reasons for reading? What do you consider essential reading for architects…of all stripes? This might be a good place to start! Haha, my parents created the reader I am today, as next to my bed is a minefield of scattered books, where each night I pick a different one up depending on what mood I’m in. I have 2 scifis, a fantasy novel, a ayn rand book, the architects handbook of prof practice, architects portable handbook, and a book on politics. 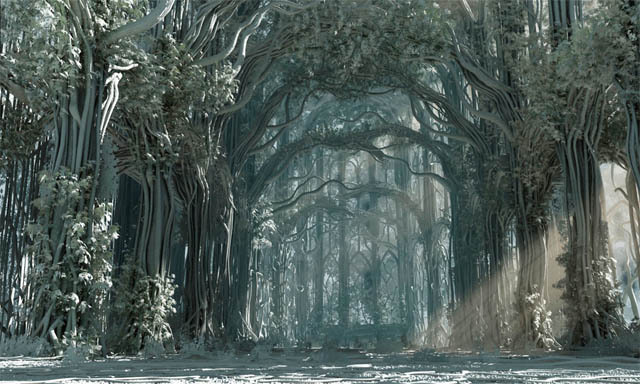 I’m all over the place, but I can pick up a book and instantly be teleported into the setting/story of the book. Thats why I love them (and I love writing as well).